LEGO Star Wars III: The Clone Wars is a 2011 LEGO game for the PlayStation 3, PlayStation Portable, Xbox 360, Wii, Nintendo DS, Windows and Nintendo 3DS consoles, and is based on The Clone Wars animated series, developed by Traveller's Tales and published by LucasArts and TT Games, released in March 2011 and is the latest game of the LEGO Star Wars video game series. 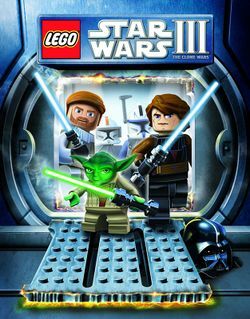 LEGO Star Wars III features missions and characters from the Clone Wars television series, as well as favorite characters from the original Star Wars saga, in both single player and multiplayer gameplay modes. The Mac OS version of the game has been released by Feral Interactive. Gameplay in LEGO Star Wars III: The Clone Wars is similar to the previous titles in the series. Up to two players switch between different characters in order to fight enemies, solve puzzles, and progress through various levels. It introduces a few novelties, including scene swap, where players can switch between teams in separate locations to complete multi-part objectives, and boss battles. The game also features some real-time strategy elements, such as commanding large ground armies across battlefields. Also, the space fights have been remodeled to use a more instinctive, 3D-space battle sensation. It is set during the Clone Wars animated series, as well as certain scenes from Star Wars Episode II: Attack of the Clones, unlike the original games, which featured characters of the six films of star wars such as LEGO Star Wars: The Video Game and LEGO Star Wars II: The Original Trilogy. This page was last edited on 30 May 2016, at 05:40. This page has been accessed 11,911 times.